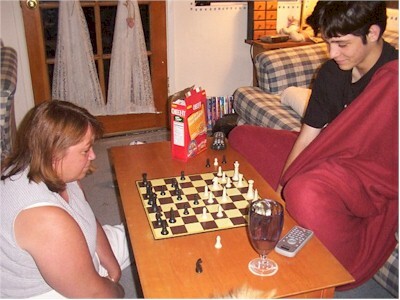 Matt and Susan played chess tonight. Some would theorize that this happened only because Susan took his computer away in sheer frustration, after exhausting all other ways to get him out of his room. Okay, maybe it wasn't quite that bad, but it was indeed nice having Matt downstairs for the evening, playing chess, laughing, and enjoying the rest of us. He's quite a nice kid to have around.